After two weeks of studying and preparing, yesterday I received a passing grade on the Google Analytics Individual Qualification (GAIQ) exam. If you are interested in taking the exam, here are some useful pointers that will help you in your preparation. You will have 90 minutes to answer 70 questions, and you need to have 80% correct answers to pass the exam. I must warn you, some of the questions can be really tricky since they can have multiple right answers, so pay special attention to those. The good thing is that during the exam, you can have other programs running – your browser, your study notes, etc. Google charges $50 fee for each exam attempt, so do your best to pass it the first time. Your main source of materials for preparation should be Google Analytics IQ Lessons. While going through these lessons, I would recommend to have Google Analytics interface open all the time, so you can follow along. Also, take time to prepare, I have spent approx. two weeks going through all these materials and taking notes. Since time is a factor, I would recommend to mark all the questions that you dont know the answer right away, you can go back and review them later. Also, have another browser window open all the time with the following tabs: Google Analytics IQ Lessons, an Analytics account and the Google Help Center. If you have successfully passed the exam, you can download your certification in .pdf format, like one in the picture below. Your qualification expires after 18 months from the date that you have passed the test. 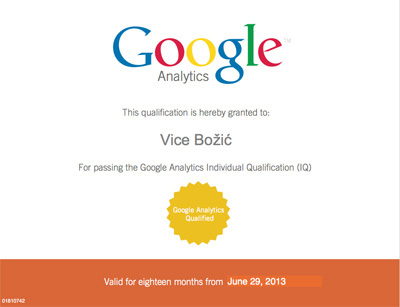 Congratulations Vice Bozic for receiving a passing grade on the Google Analytics Individual Qualification (GAIQ) exam. Thanks a lot for providing the study material as well. My question comes after you pass the exam. How long does it take until you get the certification (minutes or hours) via your email? You should get your results inside Google Testing Center immediately after you pass the exam. I also didn’t received any confirmation on my email. Makes sense. Anyways congrats with the certificate. It’s been on my planning as well for awhile now. Maybe it’s time to just do it… after some preparation/study of course. So do you have to do it all over again after the 18 months? yes, you will need to retake the exam after 18 months. It’s only logical, because lots of stuff will change in that period. Vice, congratulations on your GAIQ. Another resource that may help your readers prepare is http://www.googleanalyticstest.com. (I’m the developer and admin.) It has received a lot of very favorable feedback. Hi Eric, thank you! It’s a great resource for everybody preparing to take the exam.